As prices drop and new wireless technologies are developed, wireless keyboards and mice are becoming more and more common in home and business environments. Unfortunately, due to the differences in the way in which wireless devices communicate, choosing the best KVM Switch for using a wireless keyboard and mouse can be daunting. Beyond compatibility issues, very few KVM switches on the market explicitly state support for wireless devices making selecting your switching infrastructure difficult. This guide will go over the root causes for this incompatibility & troubleshooting issues caused by wireless devices, provide advice for things to consider when choosing a KVM Switch to use with a wireless keyboard & mouse, as well as compare using Wired vs. Wireless Keyboards & Mice for a KVM Switch. There are two main types of KVM Switches that can support controlling sources with a wireless keyboard and mouse. While neither KVM type guarantees support for wireless devices, the underlying technologies theoretically allow you to use them. Unless a manufacturer states explicit support for a Wireless Keyboard and Mouse model, we are unable to guarantee compatibility in a specific environment. In order to support Hot-Key operation and uninterrupted keyboard-mouse function while switching, most KVM Switches have a chip that constantly buffers (reads) signals from the keyboard and mouse, and transfers any button presses to the connected computer. This feature is known as 'Emulated USB' or 'Emulated Mouse & Keyboard'. While this emulation works great for wired devices, wireless devices use a different data transfer protocol that is not compatible. This is the main cause of problems when using wireless devices on a KVM, as the KVM switch will only relay signals that it understands to the computer. Though on some occasions wireless combos will function on a KVM switch that uses emulation, this is highly unusual and is entirely dependent on the user environment. If you are currently attempting to use a wireless device on a KVM, or have your mind set on a KVM that uses emulation, there are a few options that may make your wireless devices function properly. If possible, turn off USB Mouse & Keyboard Emulation in settings. Plug the wireless USB combo receiver (I.e. 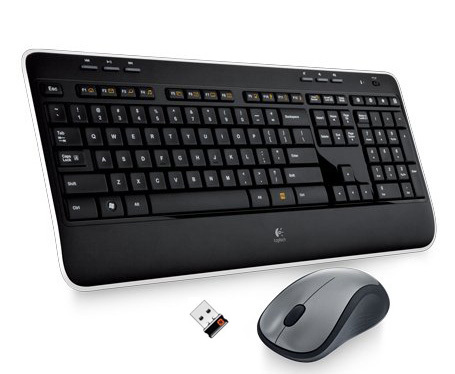 Logitech Unifying Receiver) into the keyboard USB port, and leave mouse USB port empty. If this doesn't work, try to plug-in the wireless receiver into the mouse port, and a separate wired keyboard into the keyboard USB port - you can put this keyboard aside somewhere and use the wireless devices. If the KVM has one or more USB 2.0 or USB 3 Peripheral (Hub) sharing ports, the wireless USB receiver can often be connected to one of these ports. Some KVMs require a wired keyboard and mouse to be connected to the KVM to function - you can put this keyboard aside somewhere and use the wireless devices. Un-install the driver for the wireless device. Sometimes the proprietary driver for a wireless device can interfere with a KVM, and compatibility issues can be solved by using the naitive driver included in the OS instead. - The KVMs USB specification must be USB 2.0 or greater; USB 1.0 doesn�t have enough bandwidth to support 2 wireless HID devices from 1 port. - After initial connection, wireless keyboard response may take 10-15 sec. Response delay after subsequent switches usually takes 4-5 sec. - When using a Wireless Keyboard & Mouse with a KVM Switch port switching will typically have to be done using the physical port selection buttons on the KVM unit, an On-Screen-Display menu, or a separate wired keyboard. - These steps may not work for your application. Unless a manufacturer states explicit support for a Wireless Keyboard and Mouse model, we are unable to guarantee compatibility in a specific environment. A KVM Switch with Transparent USB -USB without any kind of emulation- is more likely to support wireless devices natively without having to use a separate USB Hub port. Slight voltage fluctuations may disconnect your wireless devices occasionally, especially while idling or switching. There isn't much to do about this, but typically we have seen better results with higher quality KVM devices. Over-IP KVMs will always utilize USB Emulation; While some KVMs may support wireless devices via a 'USB Virtual Media' (USB Peripheral Hub ports over IP), we do not typically advise using a wireless keyboard & mouse with a networked IP KVM. Wireless devices with individual dedicated USB receivers have a better chance of working on a KVM than a wireless keyboard & mouse combo (2 devices) with a single shared USB receiver. The KVMs USB specification must be USB 2.0 or greater; USB 1.0 doesn't have enough bandwidth to support 2 wireless HID devices from 1 port. When using a Wireless Keyboard & Mouse with a KVM Switch port switching will typically have to be done using the physical port selection buttons on the KVM unit, an On-Screen-Display menu, or a separate wired keyboard. After initial connection, keyboard response may take 10-15 sec. Response delay after subsequent switches usually takes 4-5 sec. This guide may not work for your application in getting your Wireless devices to function with a KVM. Unless a manufacturer states explicit support for a Wireless Keyboard and Mouse model, we are unable to guarantee compatibility in a specific environment. If your mind set on a Wireless Keyboard & Mouse, it may be possible to find a KVM Switch solution for your application. However, with the drawbacks of switching delay, not being able to use Hot-key switching, and common compatibility issues even when using the steps above, we would still always recommend using a Wired Keyboard & Mouse with a KVM Switch for the best user experience.